We already have explained most of our thoughts about Henri Goursau’s dictionaries. How not to be fully satisfied with these awesome translating tools ? Up to now there were only two-language dictionaries—from English to Russian, for example. 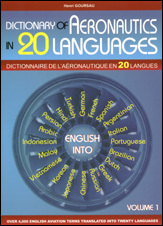 The book we introduce to you today is very impressive because it can translate more than 4 000 words from English to twenty other major languages used in aeronautics. You will find an attached list of these languages. Of course I am unable to verify the translation accuracy in languages such as Malay, Hindi, Persian, etc. But it is interesting to have a look at the list of English terms proposed for translation. It is clear we are far from the 50 000 entries in a bilingual format found in the Dictionary of aeronautics & space technology (French-English). But this 4 000 terms dictionary is a very effective tool for most aeronautical translations and a treasure to keep at one’s hand.